Now is the perfect time to buy a used car. School’s out and it’s vacation time, whether you plan to stay in town or travel by auto throughout the United States. You can find especially good deals on virtually every corner on low mileage cars in O’Fallon and the surrounding St. Louis area. A recent study by NADA demonstrates that during the first two weeks of May 2016, that the prices of pre-owned cars and trucks that are up to 8 years old are down 2.1% from April 2016. Small, compact auto prices are 3% lower and trucks and mid-size vehicles are down 1.1%. Begin your search online for pre-owned mini-vans for sale or other suitable vehicle that will meet the needs of you and/or your family. Take into consideration the purpose of your chosen vehicle. Will it be driven around the city, and primarily for work? Do you put a lot of miles on a car each year? Are there specific features that you simply cannot live without? What kind of budget do you have? For a huge selection of the best pre-owned low mileage cars in O’Fallon, visit 5 Star Auto Plaza. 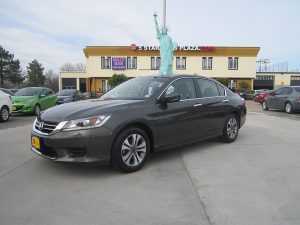 Not only do we have tremendous variety in style, age and price, we have numerous options for financing no matter what your credit rating may be. Give our experienced sales team a call today at (636)940-7600 to inquire about our vehicles currently in stock and loan application procedures. We look forward to meeting you and working out a deal on a premium used car.